Happy American Thanksgiving!! And apologies to my vegetarian/vegan/meatless friends who may find the picture below a little gross. The turkey has been stuffed, roasted, basted, carved, gravy'd, and eaten. In fact we've gone all the way through the courses to both pies - pumpkin and pecan, and I am feeling overloaded. Overstuffed. Overeaten. And a bit like my cup runneth over. Thanksgiving does that to me. It makes me gush a bit. So bear with me. I started this wee blog nearly two years ago as a way to create and share and frankly force myself to get a lot of the projects that I've wanting to do ..done. And it has done that. It has also brought into my life new connections and friends from across the globe and right in my own home town. People who somehow know me more or at least differently than some of my own family because they've taken the time to read my words, to look through my photographs, to follow my ideas. And that, my friends, is a pretty amazing gift. And so this Thanksgiving toast (raise your wine glass or your milk glass with me) goes out to all of you good people who found Pars Caeli, found me, over these last two years and have supported me with your comments, your retweets, your likes, and even just your reads. You've encouraged me and pushed me in new directions just by the click of your mouse. Time is our most precious gift, and I'm so grateful you've spent your time over on these pages. 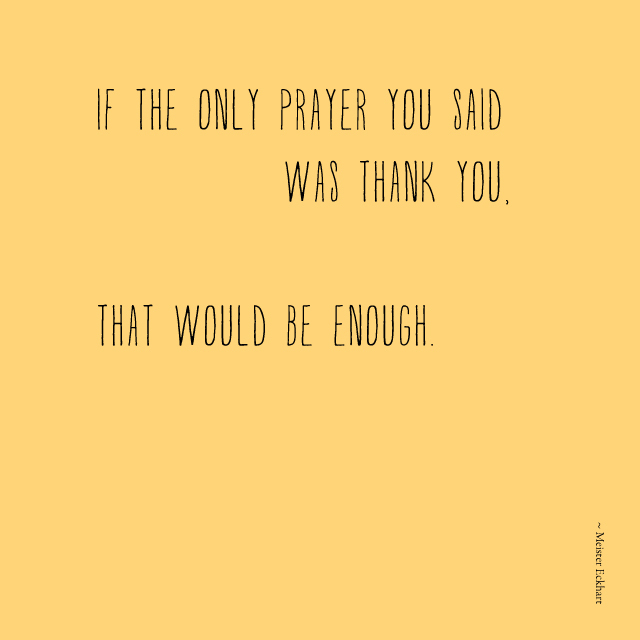 And even if you stop by just now and again and even if you've never let your presence be known, I'm grateful for you and your gift of attention. PS. We're cutting down a tree in the freezing snow tomorrow. Wish me luck. In my childhood bedroom, I often strung construction paper Christmas tree garlands and hung homemade Valentine hearts from the ceiling. Even as a youngin, I loved to decorate for these special occasions and create my own "decor." As a little girl I could rattle off my three favorite holidays, in order: Christmas, Valentine's Day, and New Year's Eve (probably not the normal conversation starter but it worked for me). No doubt Christmas topped them all for the p-r-e-s-e-n-t-s and good music. Valentine's Day was filled with pink and chocolate. And New Year's Eve was so exciting and hopeful and late-night. But Thanksgiving? Well, Thanksgiving never even made a blip on the radar screen. Fast forward a few decades later, and here I am mom, wife, and hostess for the annual Thanksgiving dinner. And guess what? My favorite holiday, hands down: Thanksgiving. 1. Having a four-day weekend that many people honor for leisure. I know this is up for debate with increased shopping schedules, tough economic/working situations, and a lot of football. But speaking just for myself, the hectic work life powers down for four full days, and I sink into the beauty of family and home and pure relaxation. 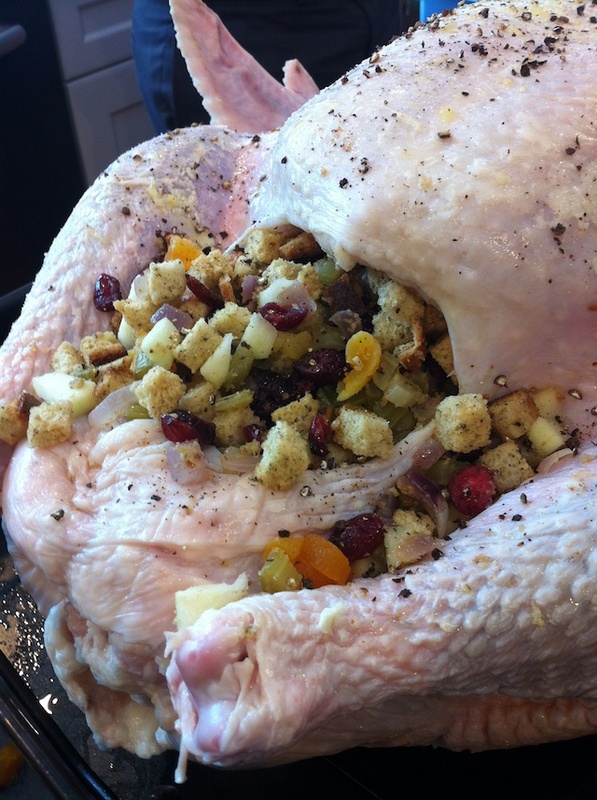 No extra projects creep into the fun of Thanksgiving...and time off really is time off. 2. Having everyone in one spot. The older I get, the more sacred this becomes for me. Don't get me wrong, this is also the element that causes me the most stress; however, I always overthink it. Truthfully, I hit the pillow every Thanksgiving night so grateful to have my parents, my in-laws, my aunt, my children, and my love all in one space - happy, healthy, and very full from a savory meal we were able to provide. 3. Having teamwork. Wednesday evening and most of Thursday is spent in food preparation (and a whole bunch of parade watching). My husband and I plan the meal together and dance around one another in the kitchen all day, prepping each dish and attending to the big bird. It's a total team effort that fills our house with the smells that are family, holidays, and gratitude. And we have hours and hours just to marinate in the experience together. 4. Having time to be grateful. At Christmas, I can get distracted away from Christ's birth with toy overload and travel prep. At Thanksgiving, I take the time to pull away just a bit from the must-do list and gaze at all I've been given. I watch the scene of my children laughing and playing make believe with their grandparents. I peek in on my daughter sharing her latest secrets with her grandma. I take a deep breath by the fully extended dining table, covered with recipes we've tweaked and enjoyed as a family for years and years. I feel the sentiment in this year's toast to good health and family, and whisper a petition for yet another next year. It's a day of very active prayer, very present moments where I feel and express the gratitude that I am graced to experience the other 364 days. And I'm so very thankful for Thanksgiving. One week from today, Americans will gather in the homes of friends and relatives to enjoy each other's recipes and companionship. Our traditions may vary from home to home, but the sentiment of gratitude threads through all of the football watching, strained family moments, and even food preparation/clean up. 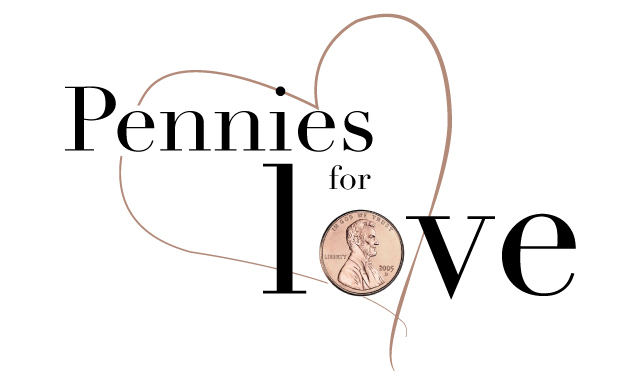 On this week's Pennies for Love, Joy urges us to slow down before the day and write a note. Pen a message to the one you love: your husband, wife, boyfriend, girlfriend, best friend. And let them know just how much they mean to you every day of the year. It begins with a simple "I am grateful for..."
Joy is sharing an example of this practice at work in her life and some simple suggestions to get you started on your note of thanks. We will be hosting Thanksgiving in our home, as we've done for 10 of the last 11 years. Filling my home wih the ones I love most and the smells of Thanksgiving is one of my favorite experiences of the year. On the day, I love the hustle of timing our courses correctly and the bustle of entertaining children and adults with projects and stories. 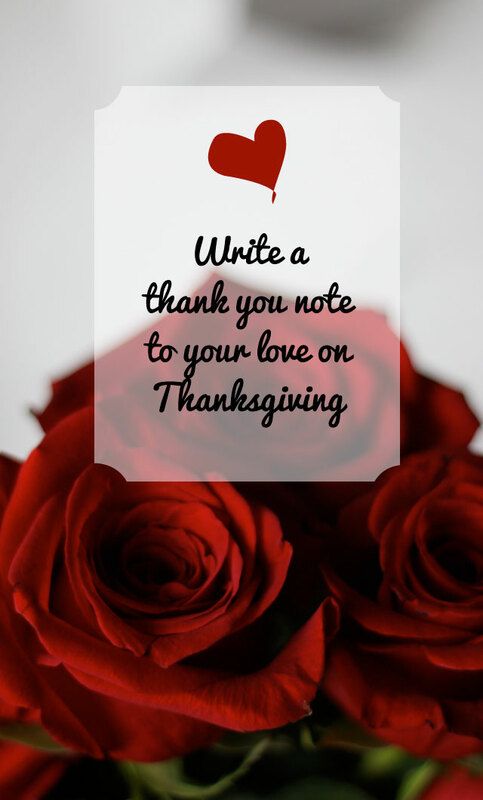 But before all of this crowd pleasing occupies my time and heart, I'm going to sit down and write one simple note of thanksgiving to the man I love. Thanks, Joy! And happy Thanksgiving. Y'all know I love the blogging community with the supportive, creative, hilarious women I have come to know and appreciate. And when I find excellence I'm just no good at keeping it to myself. I've had a handful of local friends lately ask me for new - and great - blogs to dig into in their spare time. For me, this sort of question is in the same line as tell me about your kids... I could go on and on. And actually knowing the amazing people behind these blogs makes me love them that much more. If you're looking for recipes that taste and look great, create seasonal decor to inspire, or read the latest adventures of successful, smart, and sassy women...follow one of these greats. Easy overnight cinnamon pull aparts from Melissa at Lulu the Baker. Mommy Coddle published by Molly with her incredible pumpkin bread. Joy sharing family secrets with yummy apple butter over on Frock Files. Alexandra making things fun with upcycled sweater pumpkins over on Alexandra Hedin. Gorgeous and good for you roasted carrots from Janae at Bring Joy. Learn the fall essentials with Amy from This HeArt of Mine. Happy weekend, friends. Let's make it a bright one. Phewee, friends! So sorry for my lapse in communication. Quick jaunts to NYC have a way of knocking me off my routine in the most fabulous of ways. I was there for my 24-hour job, and the city once again did not disappoint. For the first time ever, I had the opportunity to visit the Met, Central Park, and make a dent in the inventory at FAO Schwartz. And now I'm home and so ready to share with you this lovely Fresh Holiday Tradition from the glorious, Jen Cooper. She's sharing a family favorite! Have you ever made pumpkin pancakes? Oh, yummm. Much like Jen and the Cooper clan, our family loves Thanksgiving morning. We spend Thanksgiving Eve putting together our Christmas tree and chopping vegetables and fruits for the stuffing. Thanksgiving morning is filled with savory smells as my husband and daughters prepare the turkey, and all of us hang out in our PJs until after the Macy's Day Parade ushers Santa down the lane. Typically we shy away from the TV during holidays, but the excitement of the parade with the balloons and Broadway productions is the perfect way to kick off a day of fun and togetherness. I love sharing my favorite characters with the kids, and they love to Ooh and Ahh with new surprises and performances. It's an event we look forward to all year round. Thanksgiving is just weeks away. How do you make it a special occasion for your family? Next week I'll be sharing a special project you can do with every member of the family around Thanksgiving! 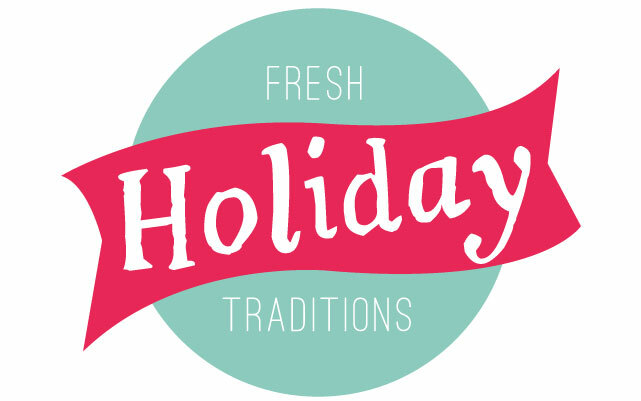 I’m working together with my blogger buds Melissa, Jen and Alexandra to show off eight fresh holiday DIYs. Every Wednesday stop by any and all of our blogs to find something new for your family this holiday season. Happy Halloween, my friends!! It is raining and cold here which means it must be the day I send my children out in a thinner layer than ever to run through puddles and eat sugar! Whatever the weather may be by trick or treating, we are going to live it up. Did you go carve or no carve on the pumpkins this year? Our crew wanted carved and painted. The beauty of painting is that it can be done weeks in advance and enjoyed for a long time. Our carving happened just a few days ago, but the impact is awesome of seeing the glow through my little's designs. As the costumes get put away and the candy remains, what will you do with all of these pumpkins and jack-o-lanterns? Likely pitch them quickly... but here's something fun for your toddlers, preschoolers, and small ones. Play Hammer the Pumpkin, borrowed right from the lessons of great preschool teachers Grab a few golf tees, a play hammer, and a pumpkin! We used one of the smaller decorative pumpkins that was never carved or painted, but ripened pumpkins, gourds and even cut jack-o-lanterns work really well (especially for the smallest of hands). For the first few holes, I got my preschooler, L, ready by starting the tees. And then he got really into it and for at least 30 minutes hammered away happily. Beware, big sisters often want to get in on the fun, too. I loved the final look of our hole-y pumpkin. 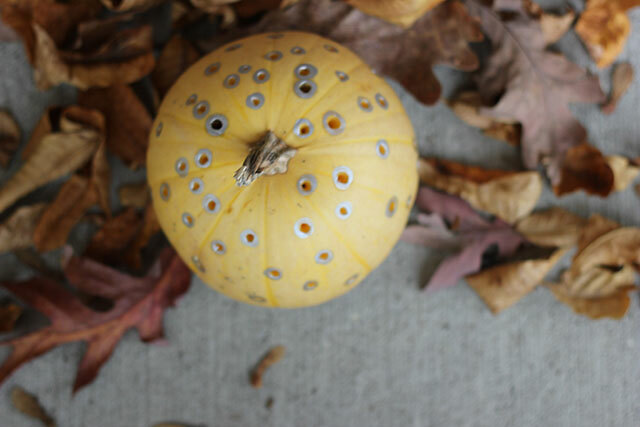 I've tucked this process in my mental file as an easy way to make a polka dot pumpkin for next year, but until then, I decided to add some pizzazz to the final drilled pumpkin. The end effect reminded me of a PUNK in...something like metal washers scattered all around. 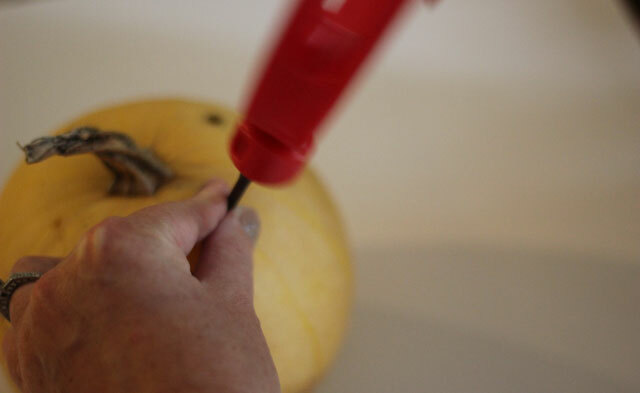 So save those pumpkins for just a bit so that your little ones can enjoy some hammering fun! Happy Halloween, friends, and happy fall! Happy Halloween eve, my lovelies. Our team is excited to head out into the possible Indiana freezing rain dressed as a witch, a minion (from Despicable Me), and Mr. Potato Head. The hubs and I, in the fun frenzy that can be shopping for Halloween costumes, purchased coordinating wigs. They are big and strange and hopefully we'll come up with a way to utilize them well - in the next 24 hours. Truthfully my head is already in Thanksgiving mode, and I'm ready to fill my home with warmth, family, deliciousness, and a heightened sense of gratitude. I am a total sap, married to a sap, trying to raise three little saps so I embrace all the emotion and tenderness that come along with the holiday as well. Head over to Lulu the Baker to find out how to spend a quick five minutes to make something special and memorable - a gratitude journal! I'll be sharing projects here at Pars Caeli. If you make one of these beauties, tag it with #freshholidays and let us know how it went!! Looking forward to crafting these with the kids this weekend!! Grateful for all of you! Hi friends, Man, oh, man, it has been busy around here! I've been away with work while my husband hung out with our kids as they developed the stomach flu. I returned on Sunday evening to a clean house, healthy kids, and a warm welcome home -- nothing short of miraculous. I'm working on two projects that I can't wait to show you, but they're not quite to the show-me stage. I'm also monster tired. And in need of a little refresh. But I've been thinking alot about the quote above. And how my best laid plans now look quite different, and I still think I'm living the life I'm intended to live. It takes me a while to adjust to different plans and the emotions I lay on that transition. But here I am. In an unexpected place, ready to embrace something new heading my way. You just never know, you know? Please excuse that unintentional day off yesterday! We're back today, and I'm sharing one of my longtime faves for fall - CORDUROY! I've lived in Midwest climates most of my life which means that chilly temperatures are just part of the territory, and for me so is corduroy. I fell in love with its endurance as a little girl in cord jumpers and pants, and as a teenager I tried it in shirts, coats, and skirts. These days I'm loving cord for the variety - so many colors, wales, and options for fashionable, comfortable, and cozy warm. What about a cord shoe? These leopard print flats with a sassy bow are from Gap. Or cords in a hot color? Cobalt blue stretch cords featured here are super affordable over at JCPenney. The cord skirt is an easy option from Loft (and already in my closet for the season). And did you know with the right brand, cord can fit you like a glove. I'm oogling this blazer from Boden (as well as a ton of other styles in their fall line). I embrace my inner cord lover every day with my Skooba laptop bag. I love the chocolate brown and the fun twist on a bag style with way too much black leather in its genre. Are you with me? 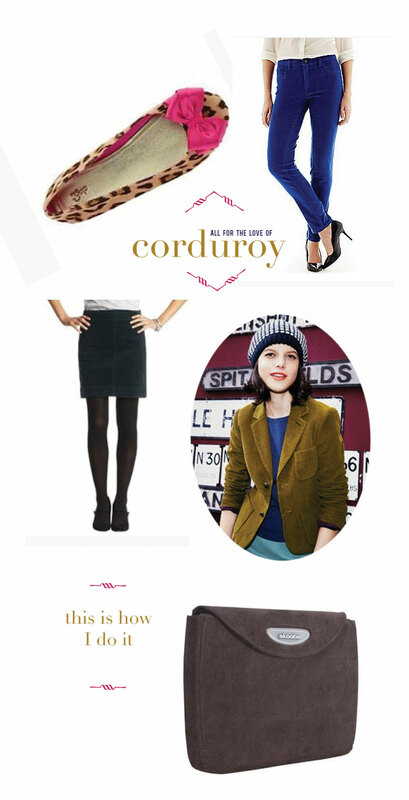 Do you embrace corduroy and all its goodness? Or is it a fabric whose days have gone by? Today, my friends, I have a delightful collaboration to share with you. I've huddled up with three of my favorite stylish bloggers to offer you the Top 4 for fall. These ladies are not fashion bloggers per se; they're classy women who exude a distinctive look. 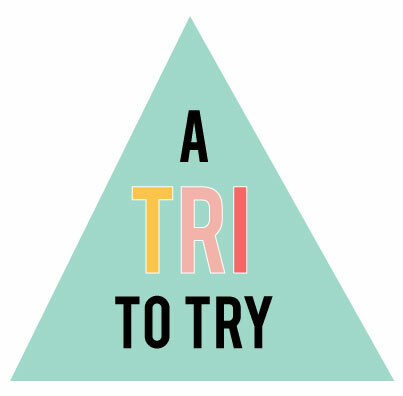 If you are not subscribing to their blogs, I highly suggest you add them to your list. Happy surprises will follow! For me it's all about some great animal prints for fall. I know this trend has been around for a few seasons. To keep it fresh for 2013, the best way to take advantage of the patterns and tones is through sharp accessories. Carried with jeans or a little black dress, this Madison Phoebe bag from Coach is on my wishlist (donations currently accepted)! The slouch and structure are right in balance and the print is beautifully organic. At $350 it would make a big dent in my wallet, but the elegant styling with hints of gold would last (right?!). The Ashby Calf Hair is a fantastic combo of wearable and statement. These 3.5 inch lovelies add punch to any outfit and are classic enough to last through the trends of a few seasons. I'm saving up for a purchase soon! And guess what, they're from Land's End. At $9.95, this umbrella from H&M is just right for any of us to add to our fall wardrobe. It's a statement, on trend, and if it grows old for you, your bank account will be no worse for wear. What's caught your eye for fall? Do share, do share!! Happy week, friends! Thanks for your understanding with last Thursday's post. I was determined NOT to get another sinus infection and spent a whole lot of time sleeping. Good news - I think I avoided this one!! Despite the warm temperatures around here, I am still dreaming of fall and the tasty treats that announce the season. 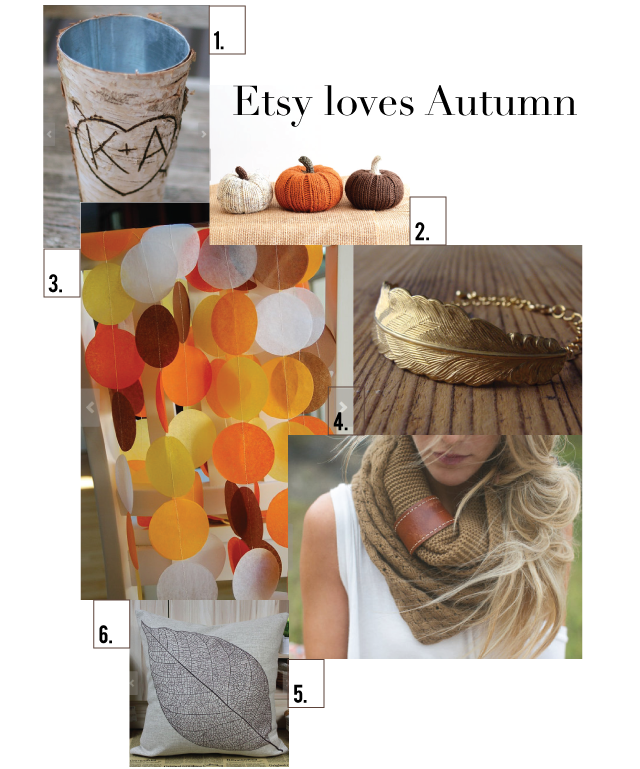 My shopping has made a turn to the fall as well, and I want to share some Etsy treasures I've found. It's been so long since I've shown off a curated post (it felt good to indulge in some handmade beauties). 1. A personalized birch vase from Bragging Bags is a sweet way to say I like like you, the old fashioned way. 2. We buy many, many little pumpkins and gourds to set around the house. These three little knit pumpkins from Luna Cab Co will never spoil and find a way to fit into any location. 3. Nothing says fall like color! Hang these fun tissue paper garlands all over. Nice work, Pipsqueak and Bean. 4. Faunay Flora Shop makes these great gold feather bracelets to accent any (and every) fall outfit. 5. Oh the scarves of autumn!! I adore the combination of leather and knit in this one from Three Bird Nest. 6. Jump into a pile of these leaf pillows. Outdoor indoor goodness from Snow Little Shop. I'll be talking fall all this week - bear with me summer lovers. Do you change anything in your home or wardrobe to reflect your love of autumn? It's the beginning of September, and I've already collected handfuls of red and orange leaves from my trees. It is not yet fall, but I can smell its arrival on the way. And, friends, I adore autumn. Dare I say, my soul needs it - the colors, the tastes, the fragrance - these carry me through the long bleak sea of gray that becomes our winter months. 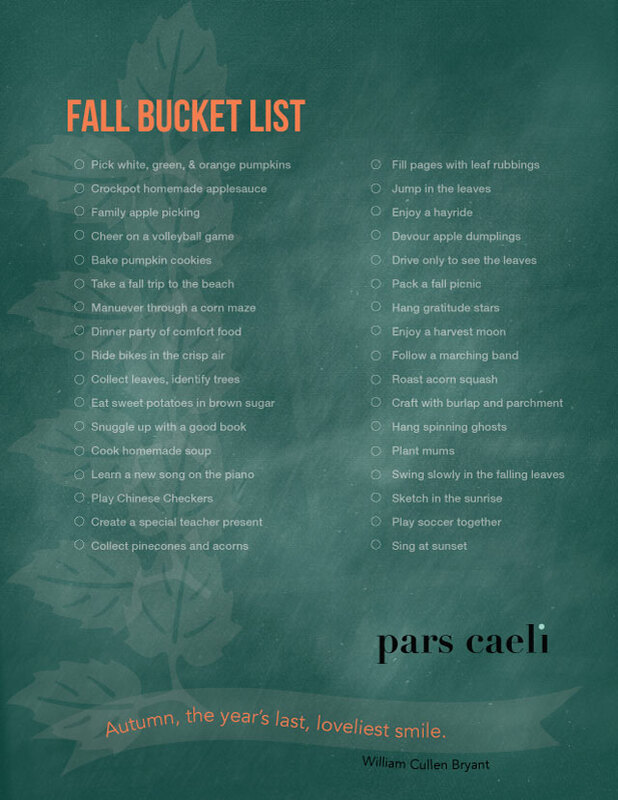 I've forced, err urged my kiddos and husband to embrace the rituals of fall, and we've created our own bucket list for the season. Whaddya think? What are you putting on your list for the season? I'd love to add some new adventures to the list this year!! Hey, friends! How are you? Happy Monday after Thanksgiving...and welcome to the month-long countdown to Christmas. :) How did the holiday treat you? We hosted all the grandparents and my aunt, too, and we cheered on my oldest in her second Nutcracker performance. It was all good, and we are all good and tired from the food fest and extreme Christmas decorating. The hubs and I have been hosting Thanksgiving for the last decade, and every year we send our guests a little homework in the mail. Three paper stars. With them they bring three paper stars filled with three (or sometimes more if they can write really small) things for which they are grateful. My dad and hubs work diligently to build our slightly lopsided artificial tree the Wednesday before Thanksgiving, and on the big day, everyone hangs their stars filled with names of important people, faith, health, and particular graces handwritten on each. The stars remain as our first decoration on the tree and our traditional ornaments get added to the branches around them. In a black, leather bound binder I've kept all of the stars through the years, and I love looking through them and remembering the gifts of years past and seeing how many remain throughout the seasons. The Christmas season is full-on upon us but maybe we can keep the spirit of Thanksgiving alive and well amidst the hustle and preparation of it all. We'll be reading and re-reading our stars (and those of our loved ones) and trying our best to focus on the gifts we've been given as we work on the gifts we are to give. Happy holidays, my lovely friends. May this one be particularly merry and bright. PS. 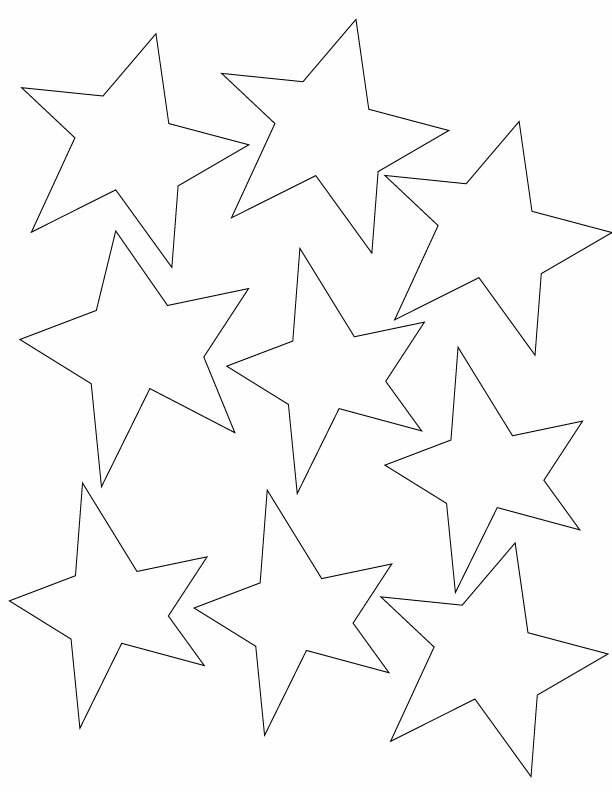 In case you want to add some stars to your own festive fun, here's our perfectly imperfect pattern. Well friends, the holiday season is officially here! We’ve made it to Thanksgiving day, which means that many of us are headed out to feast with family and friends. While this is meant to be the happiest time of the year, it can sometimes be tough to be with people we wouldn’t generally spend time with otherwise. Luckily, I really enjoy my family and James’, so I don’t end up in these awful holiday situations -- but that experience did teach me a few coping mechanisms. Should you find yourself dealing with a difficult family member this season, my hope is that these tactics will help you turn a dreadful situation into a happy (or at least tolerable) one. Take a clue from Downton Abbey. If you’ve ever watched Downton Abbey, you’ve witnessed the conversational choreography that we seem to have lost somewhere along the way. Practice being a great conversationalist by being curious and letting that difficult family member talk about his or her interests for five to ten minutes, seeing what you can learn from the chat. Then, politely excuse yourself by helping out in the kitchen, using the restroom, or heading out for a breath of fresh air. You’ll find that sometimes these individuals just need someone to pay attention to them for a few minutes, and then they don’t need to get attention by being nasty. In other words, bring along a project that everyone can contribute to. As the project coordinator, you’ll get to focus on it throughout the holiday, while each person adds their little touch. Create an ornament making station, make wreaths, make a scrapbook, work on an advent calendar. When you have a project to focus on, you have something to direct conversation toward. So much of the holidays is about sitting down and eating, but getting up and out puts everyone in a much brighter mood. Turn on the Wii and dance or bowl, go for a walk outside, or consider a short hike. I once read that it’s best to have difficult conversations while doing an activity, like driving. 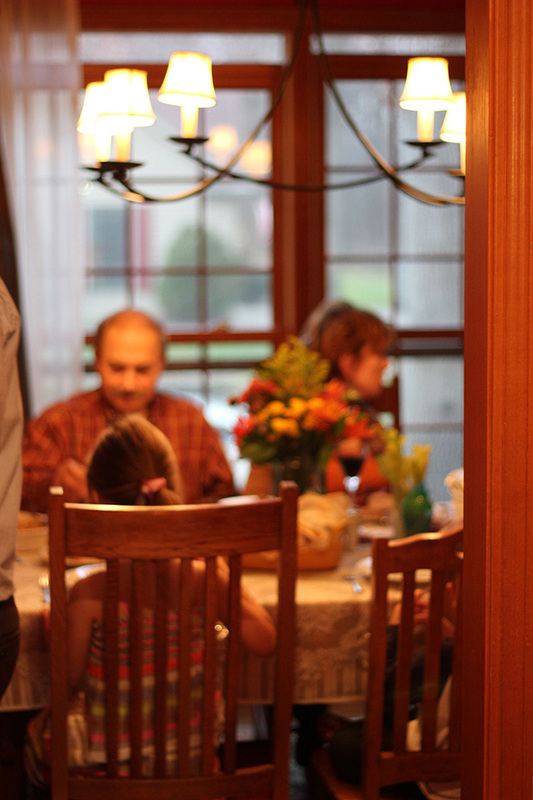 It rings true for family get togethers as well -- even if you don’t have anything particularly difficult to discuss, the forward movement opens up the door for communication that might not come naturally while sitting across the dinner table. Thank you so much, Joy!! I can attest that even a walk around the neighborhood can bring a fresh perspective to a group stuck in a rut. Wishing all of you a blessed Thanksgiving. Any other helpful ideas to Turn It for the holiday season? This is a week for gratitude, and I'm so thankful to all of you beautiful people. In the last seven months, you've brought me inspiration, support, enthusiasm, comfort, and sheer joy. This blogging thing has been a ton of work and has stretched me in great, new ways. 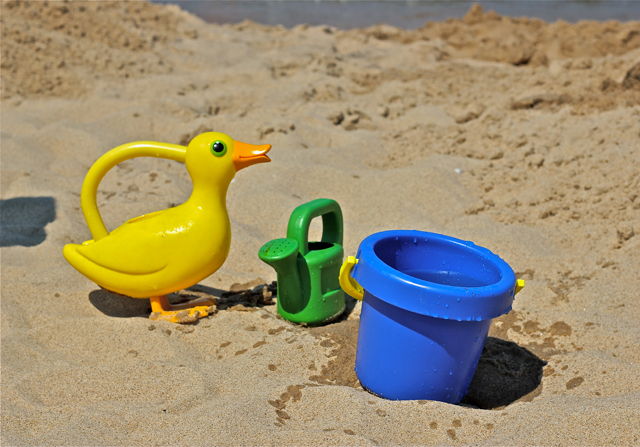 I'll be popping in and out this week as we recover from vacation (we all need that! ), prepare for our holiday, and celebrate my eldest's Nutcracker performance this weekend. Wishing each of you a fabulous Thanksgiving (and a special shout out to my Canadian and Irish pals on Thursday, too). Hi friends!! We're wrapping up our time away today, and we'll be back (exhausted) and ready to celebrate Thanksgiving next week. In the by and by, here's what else you can make festive this weekend. Today it's all about buttons so grab your collection and spread them out for all to enjoy on National Button Day. Grab your coat and hat on Saturday and let's enjoy the great outdoors for National Take a Hike Day. On Sunday we'll be ringing in the final day of Games and Puzzles Week. What's your fave? I'm a huge Othello and Upwords fan. I'm on my laptop, my phone, or the Ipad everyday...and so are my children. Strange things get stuck or deposited on the keyboard and screens. Sometimes I just want to get out the leaf blower and push all those germs out of the way. Instead let's try this. Check out this short, easy video from Momiverse on how to clean all the technology in your world (without specialty cleaners). You'll also find out what device is the dirtiest of them all. Jessica over at How About Orange has curated a fabulous stash of DIYs we can each do to spruce up that (or those) blank walls. Check out this board, and if you're not following her on Pinterest, go ahead and do that, too. You can pin some of these to your super secret boards! One year ago we embarked on the journey of home renovation, and it was definitely an experience as much as an end product. It began as an effort to extend the laundry/mini-mudroom we enter off of the garage. The overflow of shoes, backpacks, and laundry baskets was becoming a fire hazard and an unwelcome greeting to our every entrance. When we reviewed the plans, my husband and I realized we were beginning a domino fall. Move the laundry? Well, that means we should finish off more of the basement. Take down that wall? Move that stud? Well, you get the idea. In order to complete all that needed to be done, we packed up the playroom (you know that space that has every small toy, party favor, and leftover artwork in it? ), and the contents of the entire first floor of our house. Wanna learn how it turned out? Follow me over to Frock Files to hear all about it. I'm guest posting for Miss Joy over there... Tag, you're it. Let's have a bright weekend, friends. We have much for which to show our gratitude. Today's post is an addition to the Turn It series and a beautiful bonus from my friend, Paige. Check her out over at Approaching Joy, but not yet...cause you gotta read this first! Isn't the natural world awesome? I mean if it were my job to make apples, I'm pretty sure I would have been impressed with a Red Delicious and would have stopped there. But Nature? Not a chance. Granny Smith, Gala, Jonathan…Nature knows that when it comes to apples (and most everything else) variety, options, something that differs from the rest is a good thing. I think it's the same with our own blessings and the things which we count under "things to be thankful for" column. It's easy to see the good things and be thankful for them - super supportive friends, a loving family, a home that is comfortable and warm. These things are the obvious blessings of the "Red Delicious" variety. It's the other things that aren't easy to see as blessings. Stressful Mondays, mortgage payments, traffic jams, crying kids… these all just seem like the low points of life. But when you take a second and step back, you realize that these are simply Granny Smith blessings. The stressful Mondays mean you are healthy and productive. The mortgage payments mean you have a roof over your head. The traffic jams mean your family wasn't involved in the wreck ahead. The crying kids mean you were blessed with little ones. So many people don't have these things to be thankful for. 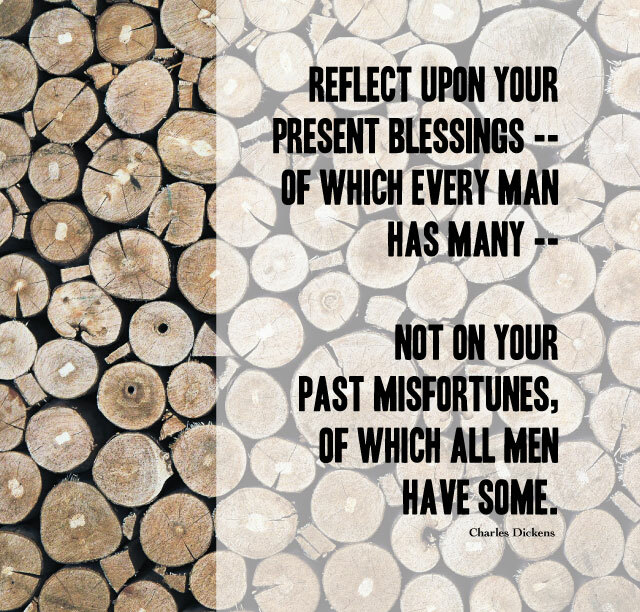 So next time you're sitting in traffic, writing that check, or wiping those tears, remember that this distinctly tart variety of blessing makes you appreciate the sweeter blessings more fully. Thank you for your words of perspective, Paige!! 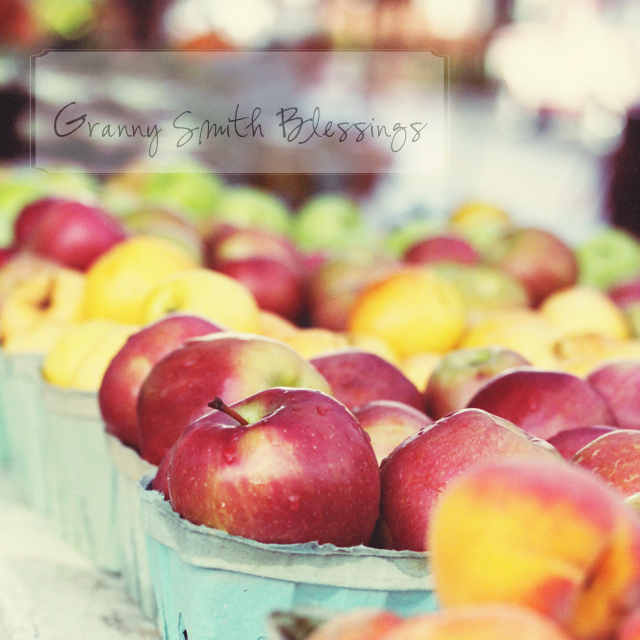 Those tart blessings are right there for us to discover if we just turn our perspective a bit. So good!! Today's gift of gratitude comes from my lovely friend, Claire, an amazing artisan, creative, and hilarious Irish women. I'm so glad I can bring her story to you. This is a photo of a mailbox (or post box as we call it here). But it is not just any mailbox. Unlike the other thousands of red mailboxes you will find in every community here, this one is painted gold. 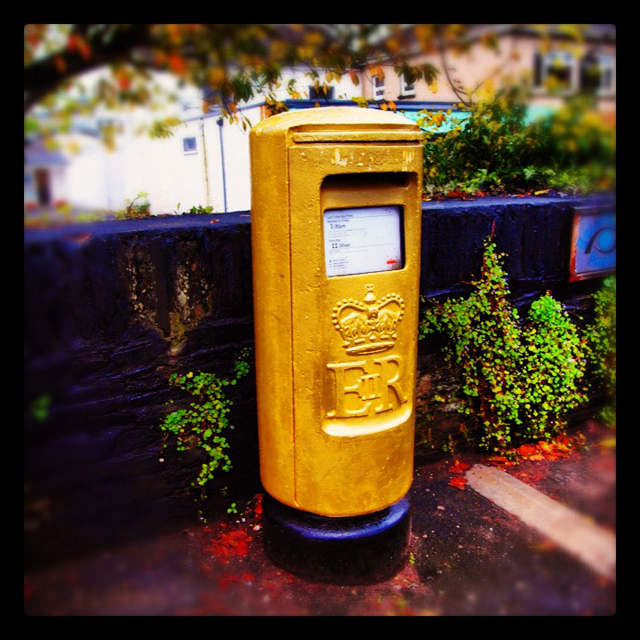 It is found in the tiny village of Eglinton in County Derry near me, and it is painted gold for a special reason. It recognises the achievement of Jason Smyth, who won a gold medal for Ireland in the Paralympic Games at London 2012 and set a new world record in the 100m to become the fastest Paralympian of all time, in an incredible 10.46 seconds! He is visually impaired and you can see his incredible achievement here. This summer was an amazing time in London and I was lucky enough to be able to attend some of the Olympic events. You can see how excited I was to see the water polo! The swimming, women's fencing final and Olympic Park were all brilliant to witness, and perhaps the best thing was the great organisation and the changed atmosphere in the city. Instead of the usual silence and avoidance of eye contact I actually had some lovely conversations with people on the Tube, as the pride and interest in the Olympics united locals and visitors alike. So in these weeks of giving thanks, these sporting achievements and the great experience I had at London 2012 are a great reason for me to be grateful. However, the focus of my gratitude today is on the unbelievable achievements of the Paralympics. The TV ad before the start of the Paralympics proclaimed, 'Meet the Superhumans' and this was so true. Every single athlete had battled not just the sacrifices of the the four years of dedicated training to achieve the highest standard in their sport, but each one also had conquered a personal disability. In doing so, they had won the hearts and admiration of those watching and helped us see their ability first, instead of their disability. Just over four years ago I had a fairly serious car accident which left me with very reduced mobility for much of that time and pretty much turned my life inside out. Despite my determination not to let my long term pain condition define me, it is sometimes difficult not to concentrate on the things I cannot do, rather than those I can, or on what I have lost rather than the experiences I have gained. As I watched those Paralympians, each of whom had suffered much more than I ever would, I was humbled by how each one of them was entirely focussed on what they could do. Humbled enough to get off the couch and get into the gym and the pool for the first time in several years. Thankful for the mobility I still have and thankful for the ways in which I can still get active. So as you watch Jason Smyth sprint to a world record, I hope that you too will be thankful for your ability to get off the couch and live a full and active life. He certainly deserves his golden mailbox!